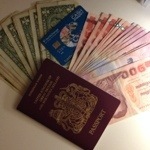 *It took me a while to get my head around the best way to take money and following some research, slight confusion and despite bad reviews, I have decided to take a small amount of cash (Thai Baht & US Dollars), loaded a Multi Currency Cashcard with Aus Dollars & US Dollars (for use in Laos & Cambodia) and left some in a bank account so I can use my debit card in Thailand and Australia. Did this last the whole trip: To be confirmed! !